Undertale has been a huge thing, recently. It’s like Five Nights at Freddy’s or My Little Pony, only there are less pre-stigmatized attachments to it, so I’m seeing it eeeeverywhere. Now, here’s my exhilerating story: I wanted to play it. But I hadn’t bought it. Then BnB Vasquestion gifted me a copy. I’ve been playing through it. And I can very easily see the appeal! It’s got a lot in common with other internet crazes: Good writing, “real” characters, a revelation on a pre-existing concept, aaaand plenty of shipping opportunities (I’m not talking about packaging here, folks). People like to call it the second coming of Earthbound, which I get (pretty sure that was Mother 3, but maybe we’re dealing in semantics here?). BUT! Writing-wise, I greatly favor Undertale. Not because Earthbound’s writing was bad, but because Undertale feels like a warm friend, whereas Earthbound feels like a quirky Japanese streaker. To clarify, I enjoy the company of both the warm friend and the naked Japanese guy. I’m merely pointing out what is most likely the key reason Undertale has become so big. It really connects with people. Earthbound did this as well, but it did so in a way I felt I’d never truly understand. Undertale feels like it’s trying to understand me. To me, anyway. I’m gonna finish up this pacifist run, then I’m gonna put up a genocide run on my YouTube channel. People tell me to get ready to have a “bad time”. 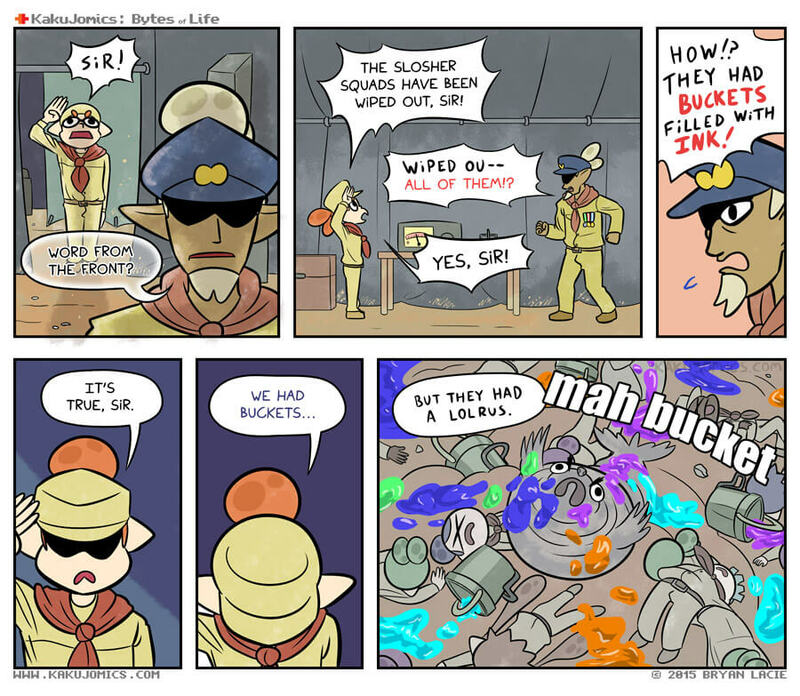 DEY BE STEALING MAH BUCKET! On the serious side. That made my day. Hahaha this is great. Reminds me of that NCH video on splatoon. Unrelated, please update the character page. I remeber being confused as F during the 100 comic special and I was hoping you would update it all by now. Your fans shouldn’t have to look through your youtube videos to understand a main character. And it’s kinda hypocritical to explain action hank, but not CORE and nuclear throne. so yeah. It’s already on the list, but time has been difficult to find. Comments like this are not encouraging.